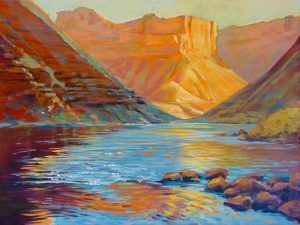 The bright colors and sense of depth and distance are rendered by David Kinker in these masterful paintings of the Grand Canyon. Seeking inspiration during a gray, landlocked winter, David Kinker revisited his collection of Grand Canyon plein air paintings and his own photographic explorations, and discovered some gems yet to be fully explored. His April show, “Painting Paradise”, opening April 5, from 4-8pm during the First Friday Gallery Walk, is a pictorial, mark-making, colorful expression of a place where the scale and vistas, shapes and colors are a holy grail for artists. and quite another as a river runner at river level, to feel the grandeur of this painted paradise”, muses David. This show embodies his perceptions of a month-long journey on the Colorado River that few people have the chance to experience. August—Katherine Taylor—A Celebration of Paint! Outfitting an array of canvases with lively textured marks made from lots of oil paint lusciousness. March Group Show—Outside Our Box: An Opportunity for our artists to embrace & explore new eas, materials, techniques and shake up their palette, perspective, approach or subject. All artists who have shown with TAC in the past 10 years are invited for a very special Group Show! Paul Alan Bennett’s signature “knit” look gouache and oil paintings and Mary Marquiss’s watercolors including a series of four seasons of vineyard images commissioned for Bend Wine Cellar who will be hosting a wine tasting during the First Friday July 6 opening. Paul Alan Bennett will present a free demonstration called “Knitting with Paint”, July 13, from 3-5pm. AN UNCOMMON BEAUTY—Paintings of the People and the Land East of the Cascades, opens Friday August 3, from 5-9pm at Tumalo Art Co. Vicki Shuck and Janice Druian have partnered on a project to document through paintings, the rural way of life on ranches, farms and in small towns east of the Cascades. The goal of the project has been to portray the people and communities of rural Oregon as they are today to further the understanding of the beauty and the challenges of rural life. Tracy Leagjeld and Carla Spence present their unique vision of the Central Oregon landscape in their show opening at Tumalo Art Co. Friday September 7. Tracy’s bold, oil monoprints and Carla’s semi-abstracted, colorful acrylics combine to make a rich visual experience. Tracy will demonstrate her printmaking technique on Saturday, September 8 at 11am. Dorothy Freudenberg takes her photography into new worlds using digital media to create her inner vision of the season. “Autumns shift asks us to release any burdens we’ve been carrying, in the same ways the trees release their leaves into the wind”, explains Dorothy. Her layered landscapes, in rich colors, capture this process of change and release. Just finishing a summer of river guiding, David Kinker has been immersed in the beauty of rivers and canyons. According to David, “the reflection and rhythms of the river are inspirational to me. They have a language that is authentic and healing to us all—metaphor and symbols abound.” His new paintings embody this inspiration. Nov—Marty Stewart—soft pastel / Helen Brown—watercolor—In Tumalo Art Co.’s November show “Earthly Delights”, Helen Brown and Marty Stewart show scenes from nature that delight the eye and also move the viewer to interpret these scenes as precious earthly assets we all need to protect. The show opens during the First Friday Gallery Walk Nov., 2 from 5-9pm. Helen Brown’s current work is a form of batik in watercolor. She draws her images on Ginwashi rice paper, begins with a light, colorful wash of watercolor, and then protects the lightest areas by painting them with molten wax. The wax resists all subsequent layers of paint. After about 6-8 layers of painting followed by more wax, she irons out the wax leaving only a watercolor image on paper. 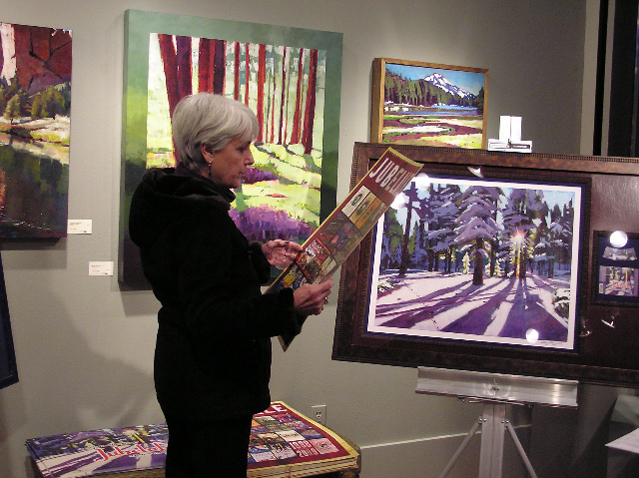 The subjects in her November show range from mountain scenes in Central Oregon and Glacier National Park to her more familiar tree scenes. From deep colorful canyons and vast meadows of flowers to trees and gentle creatures, Marty Stewart’s new work gives the viewer a rich assortment of scenes to enjoy. “Animals and birds proved to be nice additions to my usual landscapes.”, says Stewart. For Marty, painting has become a way to look deeply into the nature of things, whether landscape, figures, animals or abstract images, to see what can be learned there and shared. She often paints en plein aire in Central Oregon or on extended camping trips throughout the West with her husband.